The Niagara Falls are truly awesome! This is one place that you have to see, if you haven’t already. Read on for some super cool facts on this amazing piece of nature! Where are the Niagara Falls? Well they are on the border of Ontario in Canada, and New York, USA. 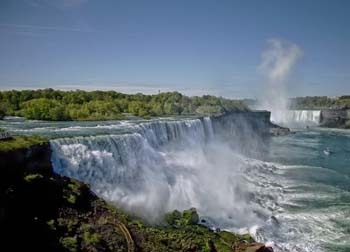 They are made up of 3 waterfalls called the American Falls, the Bridal Veil Falls and the Horseshoe Falls. 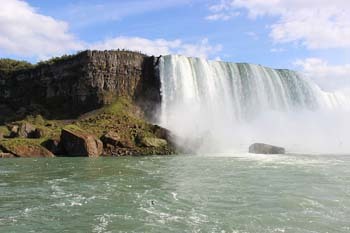 The Horseshoe Falls are the biggest and the Bridal Veil Falls the smallest. The 3 waterfalls come together to create the highest flow rate of any waterfall on Earth. The largest vertical drop is over 50m. Wow that’s quite a drop. These amazing waterfalls were created by glacier activity around 10,000 years ago. They’ve certainly been around for a long time. Niagara Falls has a large history dating back hundreds of years. The Falls were first discovered by French explorer Father Louis Hennepin in December 1678. Not only are they awesome, but they are a source of hydroelectric power. Hydroelectric power is a process used to create electricity, and these falls create a large amount of it! Niagara Falls was where commercial hydroelectric power all started. In Niagara, USA, Nikola Tesla created an invention that turned water into power that could be sent to homes and businesses. In 1895 one of the world's first commercial hydroelectric power plants was built. As they’ve got all these hydroelectric stations that use the energy of the water to create electricity, this can sometimes reduce the flow of water. So to keep those visitors wowed, they re-route less of the water, so there is still a seriously cool flow of water to see. The Niagara Falls are eroding, and that’s from all that water gushing about. Because of this, scientists think that they will only be around for another 50,000 years. Phew, you’re lucky; you’ll still get to see them. It’s not exactly very clever to go over the Niagara Falls, as you could certainly hurt yourself, but it’s also illegal. So no jumping, you could be arrested! But, even though these rules are there, a number of people have tried it anyway, some survived, some were injured and some were killed. See, not smart at all! Can you believe this? The first tightrope walker to cross the Niagara Falls did so in 1859. But there was another one too. In 2012 Nik Wallenda was the first person to cross the Niagara Falls by tightrope in 116 years. He did get permission to do this though…good on him. Goat Island sits in the middle of the Niagara Falls, between Horseshoe Falls and Bridal Veil Falls. There’s a monument there dedicated to Serbian-American inventor Nikola Tesla. He invented heaps of things, but as we know one of them was to do with hydroelectric power. So now we know why there’s a statue of him there. 30 million people visit the Niagara Falls every year. That is a lot of people. The first person to go over the Falls in a barrel was 63-year-old school teacher Annie Edson Taylor. 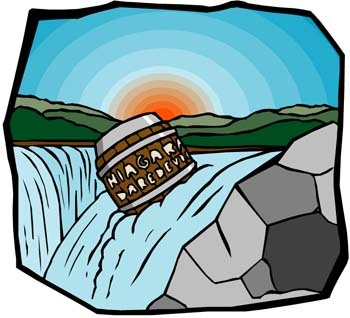 Why in the world would she go over the Falls in a barrel? Seems a bit strange don’t you think? The Cave of the Winds attraction at the Falls is torn down and re-built every year. Wow, that must take a lot of work. There are myths out there that say the Niagara Falls freeze in the winter, but it’s not true. However, the flow of water turned into a tiny trickle for a few hours on March 29, 1848 because of an ice jam upstream in the Niagara River. During times when the Falls are at peak flow in the summer and fall, nearly 2.7 million litres of water per second can pour over these great Falls. That is even hard to imagine! At one time, P.T. Barnum wanted to turn Goat Island into a circus ground. Now that would be weird! A circus in the middle of the Falls. One of the oldest surviving US flags is permanently on show at Fort Niagara. It was taken by the British during the War of 1812. So now you know everything you need to about the Niagara Falls! Make sure you get there to take a look at these and show your friends how super smart you are!